We're having a Cartoon Contest! EconoGirlfriends, want to win a FREE copy of Screwnomics? Enter our Cartoon Contest! The Scene: Jess, a single mom, aspiring graphic designer & working waitress, has received a notice from MegaBank that she’s been approved for another credit card! Is she amused, horrified, offended? Imagine what she might think & send it to us! You might just win! In any case, have fun! 1. Dream up your caption. Don’t worry about the length. 2. Use our contact form to send us your submission. Put “CONTEST” in as the subject line, and your punch line as your message. The submissions, including the winning ‘toon, will be posted on Sunday, October 14. The first 5 people to submit will win a signed copy of Screwnomics. 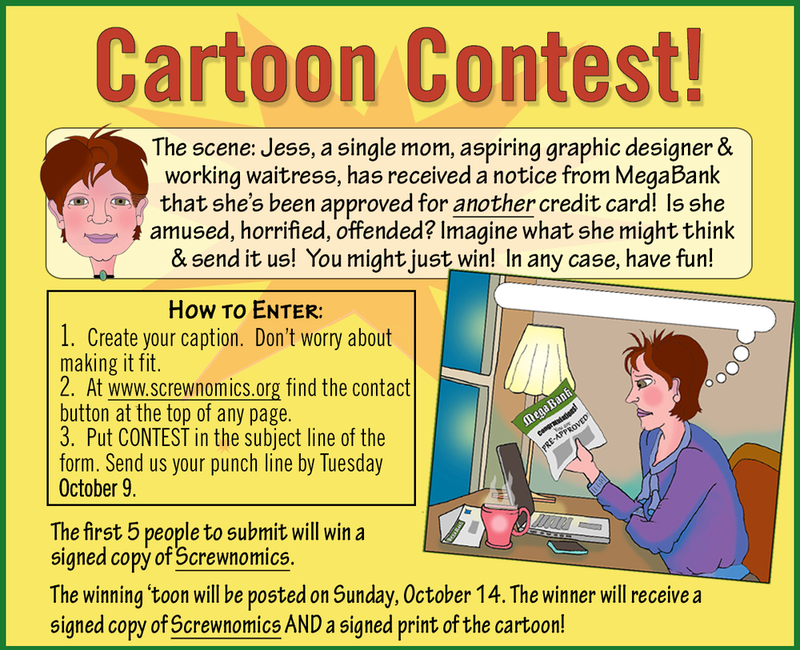 The winner will recieve a signed copy of Screwnomics AND a signed print of their cartoon!